Wauwatosa East High School is a comprehensive four-year public high school in the city of Wauwatosa, Wisconsin. It is part of the Wauwatosa School District. 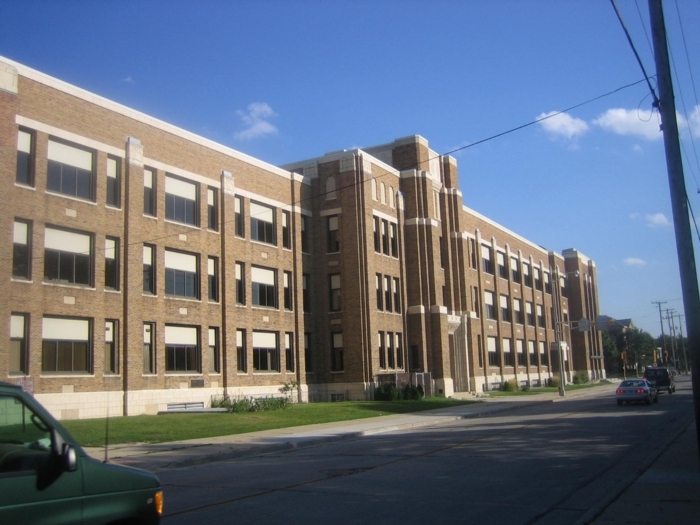 The school was originally known as Wauwatosa Senior High School until the opening of Wauwatosa West High School in September 1961. The first graduating class of Wauwatosa East High School was in June 1962. Today, the school is often referred to as Tosa East. History Originally known as Wauwatosa High School, the school's name was changed to Wauwatosa East High School in September, 1961 after a high school was built on the west side of the city. Much of the current structure was built in the second half of the 20th century. This resulted in substantial alterations to the original design of the building, including the removal of its tower and the closing of the school's third floor, which is now used by the district for storage. A restoration project in the early 2000s uncovered several WPA murals on the walls of what was formerly the school's main entrance; the murals had been painted in the 1930s and subsequently covered up. The sports teams are named the Red Raiders. They were once represented by a logo of a cartoon Indian brave in warpaint and a mascot dressed as a Native American. In 2006 this came under protest and the logo was changed to a shield with TE on the front and crossed spears behind. The mascot was also changed to a pirate. The school has varsity level sports teams for both men and women, including volleyball, basketball, softball, baseball, soccer, football, golf, wrestling, tennis, swimming and diving, cross country, track and field, hockey, and the Poms dance squad.